The art of organization to enable the art of solidarity. Koman Ilel. San Cristobal de Las Casas, Chiapas. July 30, 2016. If the multiple artistic demo nstrations throughout the week at CIDECI surprise by their diversity and quantity, the Zapatista compas expected no less. Dozens of performances covering all the arts delight those present: theatre, music, dance, painting, poetry … Hundreds of Zapatistas from the original Tzotzil. Tzeltal and Zoque peoples of Los Altos de Chiapas shared their creations throughout the day, all closely linked to the history of Chiapas, the Zapatista struggle, the struggle of the organized Mexican people and values such as autonomy, freedom, justice and dignity. On Friday July 29, the seventh day of the festival CompArte for Humanity, dozens of cars, taxis, vans and pick-ups left San Cristobal heading towards Oventic, where for the first time at the festival, the protagonists and creators of the artistic manifestations were the Zapatista compas. The day dawned sunny, and from 9 am caracol II Resistance and Rebellion for Humanity, Oventic, began to receive hundreds of Zapatistas and artists, participants and spectators who had enjoyed the festival throughout the week. Musical performances went through various styles, including traditional, ranchera, corrido. hip hop or pop. They played instruments such as the harp, guitar and accordion among others. Dances, often set to live music, were a favourite art of the compañer@s. Many of the dances were traditional, but there were also some surprises, such as the Vals del Obrero, in which the compas danced ska and enthused the public. The plays were warmly applauded, because through these processes or moments in the history or the present of the people of Chiapas, the Zapatista struggle and the Mexican people were reproduced. Poetry also played a major role both in Spanish and Tzotzil. And finally, painting, which was publicly and always accompanied with a presentation that contextualized it. The day began with the words of Subcomandante Insurgente Moisés, who welcomed everyone and dedicated a few words to expressing the feelings of the Zapatistas in the context of the festival. With his words, he made a strong criticism of paid journalists, whom he defines as “intellectuals of lies”, and who have focused in their journalistic work on the events in San Juan Chamula; he accused them of treating the case superficially, in the best interests of power and not contemplating the depth of the facts, conditioned by a history full of repression and injustice. He also spoke of the relations of economic power and the inequality latent in all contexts: “We mistreat workers in the country and the city equally.” He added: “Without their exploitation of us, they would not be rich.” Moisés set the present in the context of a lack of justice throughout history, especially for the Mexican people and their ancestors. A reality that in recent years has been reflected in events like the massacre of Acteal, the ABC nursery, Ayotzinapa and many others. The opening words ended with a call to struggle and to the organization of all the sectors, the teachers, the health sector and the Mexican people. “There are differences, but we all want health, justice and democracy, and that unites us”. In the closing speech, Subcomandante Insurgente Moisés invited all the attendees to go to the rest of caracoles to enjoy the “thousands of artists” who are still to be seen, as he exclaimed with his usual sense of humour. But his message focused on talking about the meaning of art for the Zapatistas, the art of solidarity and the art of organization to make solidarity possible. As an example he explained how Zapatista women and men had organized to feed the Chiapan teachers of the CNTE who are in resistance. In this collective work also the art of mathematics, of calculation is needed. He also spoke of the need for art to develop the imagination. “Poor women and men from the countryside and the city have the imagination to create a new society, but lack the ability to organize ourselves,” he said. Oventik, Chiapas, Mexico. July 29, 2016. Around noon today the festival CompArte for Humanity began in Zapatista territory in the caracol of Oventik. To the sound of revolutionary ballads (corridos) such as “el Campesino”, “el 69”, “Comandante Insurgente Pedro” the musical group “Los Originales de San Andrés” welcomed national and international artists who responded to the call of the rebel group. Subcomandante Insurgente Moisés read the communiqué from the Clandestine Indigenous Revolutionary Committee-General Command in which they called on those who work work in teaching and in health and the people of Mexico and the world, to organize and fight to the end. Also, in respect of recent events in San Juan Chamula, the Zapatistas reported “what hurts us is what really happened and not what the paid media says, they do not say anything about the others who went to die in their home places, there were not only five dead “. Later, among the artistic activities, they began the dance, poetry and theatre where they showed those attending and indeed the whole world the struggle and resistance of the Zapatistas. Mexico is living and dying for the sins of the global economy. The price of cheap clothes, cheap drugs and cheap labour is paid by the hundreds of thousands dead and disappeared in the last decade alone. From the North, an empire casts shadows of the end of the world. But from the South, an anti-thesis to empire shines, and the beginning of the world arises like a shining star whose five points stand for five continents. Last month it was my privilege to be a student in the mountains of the Mexican Southeast. This school dispenses no degrees or diplomas, yet it has inspired and transformed millions around the world. This school is the Zapatista Army of National Liberation, and its civilian bases of support whose autonomous self-government administers roughly half of the state of Chiapas. For the last two decades they have been building and defending one of the world’s best hopes. In 1994 the Zapatista uprising awakened the world to a reinvention of revolutionary politics. Over two decades later, its lessons are more relevant and revelatory than ever. As we traverse calendars and geographies between the end and the beginning, between the collapse and the resurgence, these lessons carry us beyond the chaotic conjuncture toward the holistic horizon. This is some of what I learned at school; six theses for the long term regeneration of humanity. 1/ The cure for the femicide machine is the forest garden. We can understand the femicide machine as part of what Raquel Gutiérrez Aguilar calls “the painful and cruel ambitions – not only military – to reinstall a totally dominating and sick masculine symbolic order.” (Aguilar) Like ISIS, like Trump, like Putin, like Modi, and too much more, the femicide machine in Mexico and its diverse functionaries express the murderous desperation of a patriarchal order confronted with its own contradictions. Luckily, the antidote is ready, radical, resurgent. The cure and antithesis to the femicide machine is the Mayan forest garden. Vital examples of this ancient mode of production are still alive in forest gardens, which are also biodiversity hot-spots, throughout Southern Mexico, Guatemala and Belize. And the Zapatistas are among its guardians. This I read in a recent and revelatory book titled “The Mayan Forest Garden” by Anabel Ford and Ronald Nigh. While they don’t mention the Zapatistas, they know the territory: “The Lakuntun agricultural system… is therefore a glimpse into the past – a quintessential example of the high-performance milpa.” (Ford and Nigh, 65) They chronicle a calendar which stretches back eight millennia, when population densities greater than those existing today were maintained in harmony with biological diversity, where “the dominant mode of production was the milpa forest garden.” (ibid, 124) I glimpsed it too, while working for an afternoon on the milpa with some Zapatista teenagers – not just the past, but the future. The forest garden produces and prefigures all the solutions we need, ecologically and politically: it produces high quality food, regenerates woodlands, prevents erosion, increases soil fertility, preserves and propagates biodiversity, cleans and efficiently manages water, generates no waste, uses no fossil fuels, no artificial pesticides or fertilizers, and sequesters carbon in the soil. The social relations of production in the forest garden require free association and decentralization, replacing alienated labour and mechanization with “intensification of skilled labour and ecological knowledge.” (ibid 69) The political consequences of the forest garden were recognized by the conquistadors, for whom their destruction was a key aspect of counterinsurgency. Today the same struggle is still on. It’s the milpa versus Monsanto and mass extinction, the forest garden versus the femicide machine. 2/ The caracol of cosmovision outpaces the locomotive of history. The symbol of Zapatista resistance is the snail, or caracol. “Lento Pero Avanzo” is its slogan and credo: “slowly, but I advance.” The highest authorities in Zapatista civilian self-government, known as Councils of Good Government, are located in base areas called “caracoles”. The symbol represents the shells which once were used to call gatherings; also the spiral which represents time and infinity; and finally, it invokes “the speed of democracy,” of which government negotiators at the San Andres accords complained bitterly: Everything moves slowly, at the speed of conversation and consensus; poco a poco, or “kun kun”in Tstotsil. Slowly but surely. And here’s the paradox: in the Lacondona, in el Sur, where everything moves slowly, political organization seems so much more advanced; while in el Norte, in the metropoles of the world, everything moves so quickly, and yet our organizations and politics seem so backwards. Somehow the snail overtakes the locomotive! The imaginative cosmovision which takes its metaphors from nature overtakes the deterministic history which sees itself in the mirror of industrial production. On December 22, 2012, as 20,000 Zapatistas in perfect silence filled the streets of San Cristobal de las Casas to announce the end and the beginning of the world, the locomotive loses the race.¿Escucharon? The locomotive’s schedule moves at the speed of production, while the snail’s calendar moves at the speed of reproduction. The train races at the artificial light-speed of the business cycle, while the caracol crawls at the natural speeds of the seasonal, solar, lunar, and galactic cycles. And suddenly the snail slips ahead. There’s something else to it as well; I saw it in a painting at the University of the Earth, where indigenous youth gather to learn everything from art to architecture and from weaving to world-systems analysis: The painting, stacked in a corner alongside dozens of others, showed a huge red-orange sun, glaring over dead trees, seeming to invoke the heat-death of the planet billions of years from now, as Earth’s orbit spirals towards its end, entreating in black letters along the bottom: “Do it now. The future doesn’t belong to any person.” The snail moves with no less urgency than the locomotive. Imagine if we all moved as urgently towards the distant future as we do towards tomorrow. Studying with the Zapatistas, we learned that in Tsotsil (one of at least five indigenous languages spoken throughout Zapatista territory) there are two different words for wealth: takin and skulejal. Takin means money, or more broadly, artificial wealth. Skulejal signifies natural wealth, measured in life, in community, in happiness. Each form of wealth is produced by a different form of work. The two verbs for work are kanal, which means work for money and for a boss; individual and alienated, and a’mtel, which they define as true work; collective and freely associated; its own reward. The two kinds of wealth and work aren’t only distinct, they are antagonistic. To work individually for artificial wealth undermines the collective pursuit of natural wealth. While discussing the implications, the subject arose of the rich who are poor: “Automatically they aren’t rich!” our teacher said about the 1%. This antagonism isn’t new to Mexican history. Over 100 years ago, Pancho Villa proclaimed and invited: “The tortillas of the poor are better than the bread of the rich. Come!” (Reed 74) And we are coming, gradually, towards new ways of work and wealth, in successive approximations towards new theories of value. John Holloway writes recently that people rebel not because of their poverty, but because of their wealth – their natural wealth; their community, dignity, history, etc, which refuses to sell or submit. And you can see it and believe it in Chiapas, where natural wealth is rising up against artificial wealth. Where the poor are rich. Life is better beyond capital, and this common sense culminates in the Zapatista hospital, where the surgeons also do the cooking and cleaning, where herbal tinctures prepared on site are prescribed alongside allopathic medicines, where the doctors sleep on the second floor, get only eight days of vacation every three months, and receive no salaries, but are happy and proud to do this collective work, because of their consciousness and their love for their community. Every week, two to five babies are born there, who will grow up rich on tortillas and dignity. The inevitable outcome of a philosophy which understands humanity and nature as fundamentally distinct and even antagonistic, is a world where one must die for the other to survive. Either destroy forests to build cities, or destroy villages to preserve forests. Thus environmentalism, whether in good faith or bad government, premeditates and prepares eco-fascism. This paradox points the way to the profound shift which is necessary in how we understand ourselves and nature. The antithesis and antidote to environmentalism and eco-fascism is hard-wired in the grammar and vocabulary of Tsotsil and other indigenous languages, in which there are no objects, only subjects, and where humanity is understood as an inseparable part of nature. And it is embodied and prefigured in the Zapatista institutions of self-government, which reflect the milpa forest garden as mode of production and reproduction. 5/ Good government is natural. The Zapatista reinvention of democracy is one of the most important and inspiring political lessons which concluded the 20th century and jump-started the 21st. The Good Government Councils (in contrast to the malgobierno, or “bad government” which characterizes the whole state apparatus from federal to local) are among the only political institutions in the world to have truly surpassed the ancient Greeks; a system of rotating and recallable elected civilian authorities, but, crucially, without slaves or patriarchy. The details are fascinating, but the most important lesson I believe is the general one: Good government is natural. It grows in the embrace of its local soil and sky. Leadership rotates like crops. Diversity is respected and protected. The goal is “a world where many worlds fit”; polycultures in the milpa and in the municipality. Many revolutionary movements in Latin America over the last twenty years have been successful precisely insofar as they have transformed the state; constitutionally, institutionally, legally, structurally and subjectively, etc. It is now this same state which is falling back into the hands of the Right, through more or less the same procedural mechanisms by which the Left took and transformed it. It’s only catastrophic if you can’t see past the state as the only destiny of politics, or past the party as the only destination of democracy. If you can see beyond, and understand this moment not as the beginning of the end, but as the end of the beginning, then the circuit reopens – not a cycle, but a spiral! Something seismic is going on in Mexico. Fundamental contradictions heave beneath the surface: Contending modes of production; rival rhythms and speeds of time; antagonistic concepts of work and wealth; radically different understandings of humanity’s relationship to nature; polar opposites of political theory and practice. The “Insurgent Mexico” reported by John Reed at the beginning of the 20th century rode the revolutionary railroad from the North to South and at last to the capital. Today, Resurgent Mexico can be read rising from the South to the North, at a snail’s pace, to a new world; a new calendar and geography, beyond capitals. “Ya se mira el horizonte,” the first verse of the Zapatista hymn sings: We can see the horizon already. San Cristobal de Las Casas, Chiapas – After the violent tragedy in San Juan Chamula on the morning of July 23, several questions arise. What’s behind the criminal acts? Lomeli has observed the evolution of the Chamula people both in the municipality and in their numerous forced exiles to San Cristóbal de Las Casas and Las Margaritas due to conflicts that occurred more than 30 years ago during a period of great communal violence of religious and political nature. It was a commonplace to say that in Chamula, one could only be a member of the PRI and a “traditional” Catholic, opposed to the “liberationist” doctrine promoted by Bishop Samuel Ruiz García beginning in the 1970s. “The distribution of religious and political cargos [positions of responsibility] has always been an authoritarian act which was accepted as a way of serving the people and God. But previously, the cargos represented an honour instead of an obligation,” says the researcher. The new multiparty system seemed to confirm that the PRI ingredient was indispensable. In reality, an agreement between the hegemonic groups was always necessary. The current governor, Manuel Velasco Coello [2012-2018], in a campaign event in Chamula, declared that whoever won Chamula would win the governorship of Chiapas. There is no president or governor who hasn’t received his baton of office wearing the traditional Chuj [local Mayan subgroup] costume and sombrero. Velasco Coello began his ongoing campaign to become governor as a member of the PVEM [Green Ecologist Party of Mexico] in 2000, with a presence in the media and through tours of the state. He has been a state and federal deputy and senator. He formed a team of young officials and recycled veteran politicians, especially at the municipal level. According to Lomelí, “already before the last campaign, the Chiapas geography ‘was painted green’, based on political organizations of PRI extraction”. For the municipal elections of 2015, Eduardo Ramírez Aguilar, first as Secretary of State Government and later as president of the PVEM, managed to convince local politicians to compete under the banner of PVEM. Zapatista Army of National Liberation. Although we could not replace the money that had been allocated for food and transportation for our artistic community, as Zapatistas we sought a way not only to reciprocate the efforts of the artists who responded to our invitation to CompArte, but also to make them feel the respect and admiration their artistic work inspires in us. Caracol of Oventik: July 29, 2016, from 10:00 national time to 19:00 national time. Participation by Zapatista artists of the Tzotzil, Zoque, and Tzeltal originary peoples from Los Altos in Chiapas. CIDECI, San Cristóbal de Las Casas: July 30, 2016. A Zapatista delegation will attend CompArte as listener-viewers. Caracol of La Realidad: August 3, 2016, from 09:00 on August 3 through the early morning hours of August 4. Participation by Zapatista artists of the Tojolabal, Tzeltal, Tzotzil, and Mame originary peoples as well as mestizos from the Selva Fronteriza zone. Caracol of La Garrucha: August 6, 2016, from 09:00 on August 6 through the early morning hours of August 7. Participation by Zapatista artists of the Tzeltal and Tzotzil originary peoples from the Selva Tzeltal zone. Caracol of Morelia: August 9, 2016. Celebration of the 13th anniversary of the birth of the Zapatista caracoles and the Juntas de Buen Gobierno, from 09:00 on August 9 through the early morning hours of August 10. Participation by Zapatista artists of the Tojolabal and Tzeltal originary peoples from the Tsots Choj zone. Caracol of Roberto Barrios: August 12, 2016, from 09:00 on August 12 to the early morning hours of August 13, 2016. Participation by Zapatista artists from the Chol and Tzeltal originary peoples from the Northern zone of Chiapas. In order to attend you will need your CompArte registration name tag from CIDECI and to have registered at the table set up for that purpose in CIDECI as of the afternoon of July 27, 2016. Note: bear in mind that here…well, everywhere, it is storm season. We know that the great majority of you will not be able to attend all of the presentations now that the calendar and geography have been expanded. Or perhaps you will, that is up to you. In any case, whether you are there or not, we will present with you in mind. THE PAID MEDIA WILL NOT BE ALLOWED ACCESS (even if they pretend that they also work for the unpaid media). The compa media—that is the free, autonomous, alternative, or whatever-you-call-it media—will be welcome, even by the Tercios Compas, because here we do have trade solidarity. As Zapatistas, on this day we reiterate our support for the demand for truth and justice for Ayotzinapa and all of the disappeared that is tirelessly maintained by the mothers, fathers, families, and compañer@s of the missing. To all of them, those who are missing and those who search for them, we offer our greatest embrace. Your pain is our pain and our dignified rage. The Zapatista “CompArte por la Humanidad” festival initiative began on July 19 with an event at the teachers’ and popular camp that blocks the exit to the highway to Tuxtla Gutierrez in San Cristobal de Las Casas, where local artists and spectators arrived, both nationals and from other parts of the world. After the welcoming ceremony, the National Coordinator of Education Workers (CNTE) in the highlands of Chiapas, which heads the movement, left the word to Berta Nava, mother of Julio Cesar Ramirez Nava, who was murdered on the night of September 26, 2014 in Iguala (Guerrero), and Omar Garcia, ex-student teacher of Ayotzinapa and survivor of that night. Both opened the “CompArte por la Humanidad” festival, remembering “the missing and fallen of the night in Iguala, to whose pain is now added that of the massacred on June 19 in Oaxaca.” 19 pieces of poetry, music, acrobatics and theatre were presented as well as two projections of indigenous resistance in the Cauca (Colombia) and the Kurdish revolution. If there is a place in the country where political engineering experiments are dangerous exercises, it’s in the municipality of Chamula, in the Highlands region of Chiapas. Because that, as a matter of fact, seems to be a component to consider in the events that took place yesterday in the municipal seat, where a confusing shooting ended with, as of last night, an undetermined number of victims, among them, the mayor and a local representative. In this context, what does political engineering mean? The expression refers to the deployment of a system whose purpose is to exploit (or possibly foster) the tensions and contradictions already present in a social group to gain political benefits foreign to the interests of that group. It doesn’t take much to trigger an outbreak of violence in the Highlands region: the long series of clashes that have taken place there since the 1970s, where religious disputes, economic rivalries and bitter struggles for political power have woven a tight web, left that part of the country in a state of latent conflict and at risk of losing, at any time, its precarious social balance. As a result, the community life of the municipality’s indigenous population has been undergoing a gradual process of erosion that has damaged, in addition to mere coexistence, the dynamics of the habits and collective practices of that population. And as it usually happens, the winning fishermen in those troubled waters were the members of the political class that have been holding the main political posts in the region and state. Yesterday’s events occurred after those on the 20th of this month when more than a hundred supposed residents of San Juan Chamula, carrying some improvised weapons and some not so improvised, atttacked a blockade that members of the National Coordinating Committee of Education Workers maintained on the highway between Tuxtla Gutierrez and San Cristobal de las Casas. In the attack, which left several injured-at least one teacher with a firearm, they had the coverage (or in other words, protection) of members of the state police. After the violent eruption, it was said that the protagonists were farmers, merchants and craftsmen whose livelihoods were affected by the blockade. However, the group of indigenous people who carried out the action showed that to be untrue, as they were armed and maintained a hostile attitude towards the teachers. Officially, it was said there were some detainees, but no authority has taken the time to speak more about the subject. And then, almost without interruption, one of the usual community protests ends in a bloody shooting, in which, in addition to handguns, R-15 and AK-47 rifles were used. It is difficult to venture a hypothesis to acceptably explain the sudden upsurge of violence in Chamula, although it’s not insignificant that it occurs as the actions of the teacher’s conflict reach Chiapas. In any case, if the two acts of violence are linked and are due to the unfortunate calculations of a sector interested in ending the CNTE protests, it is expected that sanity will prevail over impatience, irritation and the temptation to push solutions based on force for problems that require, above all, a willingness to negotiate. Finally, we should remember that, from another angle, the Zapatista National Liberation Army had warned a few days before about the risks involved in irresponsibly taking advantage of the struggle between the government and the CNTE to rekindle any hostilities against its members. “It was a massacre,” says a young witness to the shooting that occurred here yesterday at 8 o’clock in the morning in the central plaza of this traditional and famous Tzotzil locality. An act of demand from various communities, something common here, turned into a lethal shootout that cost the life of Mayor Domingo López González and the council member Narciso Lunes Hernández, as well as an undetermined number of dead and wounded, although those residents present agree that around 20 could be dead, the majority from bullets, but also from machetes. It is difficult to know the precise number, but the testimonies agree that the first shots came from the city hall. “After listening to the dissidents he asserted forcefully that he would deliver those resources later, and he asked the people to withdraw. Then he entered the building. The people did not disperse, and then rockets and ‘bombs’ (of gunpowder) came out from inside the building, and the first gunshots.” Various subjects, some masked, who arrived with the PRIístas, had taken up positions below the municipal palace. They were carrying rifles and started to shoot at the building. This group has previously appeared with their faces covered in their protests in Tuxtla Gutiérrez. It was then that the mayor attempted to leave through the back, but the masked men went after him and they immediately shot him. “They came for that, they were prepared. “He also had to have others in the streets above, because some came out running and others went behind shooting,” adds the young man, who requests anonymity, but speaks with total fluency and in good Castilla. Three other men surround us and just listen. The first shots came out of the municipal presidency, according to this version, confirmed later by two other indigenous men present in the plaza, who surrounded a man standing on his feet with a bullet wound, who with a hand on his abdomen observed the police arriving in the plaza after 11 o’clock in the morning, almost three and a half hours after the events. “How long did the shots last? No more than 10 minutes. All the people started to run to the edge of the plaza. Women? Many came, but they stayed at the edge. Yes, some of them were wounded; I don’t know if there were any dead,” the witness explains to La Jornada. Apparently there were other shots afterwards. The municipal building, painted completely green, is barely separated by a narrow passage from the municipal building of the Institutional Revolutionary Party (PRI, its initials in Spanish). “With red hearts,” proclaims a big sign on its facade. On the side, the presidency shows numerous bullet impacts and broken windows. High-powered weapons were used, according to what a ministerial agent said later, when the police finally arrived. They found cartridges from a 45-caliber pistol, an AK-47 and an R-15. A hole in a curtain is identified which a police agent of mature age considered to be a shot from inside. The photo shows the 2 municipal buildings, (one green, one red), as well as the plaza, now taken over by police. The body of an older man lies over an abundant puddle of blood on the line of the small area of a soccer field traced at the western side of the plaza. His loneliness is absolute; no one is nearby. An elderly woman remains seated on the stairs at the side of the plaza, as if she is unrelated to everything, silent. Another body remains in sight on the street that goes to the market. According to the testimonies, the mayor and his councilman would have fallen (dead) behind the municipal presidency when they were attempting to flee. The number of individuals who died in the plaza is unknown, because their family members or companions removed them before 10 o’clock in the morning. According to two Chamulans from the municipal capital, two Nissan “Estaquitas” (trucks) entered the plaza after the confrontation, some indigenous men picked up the dead and injured, and then they went away. After the shootout, the masked men who killed Domingo López and his collaborator carried the bodies to the front of the city hall, and with gestures and shouts pointed to them and called to the people that were approaching. At least one was re-killed there. “He was already dead, you can come now,” they said. “But the people had not come to fight. They were not informed,” the witness says. By then, the hundreds of indigenous who were protesting had fled and only residents of the municipal capital remained, unrelated to the tragedy, but too deeply affected to be classified as voyeurs. The town is in a state of shock, the streets deserted, except for small groups of men. In fact, the only time that some indigenous attempted to question the reporters was when a state functionary headed to a group of his acquaintances and indicated: “remove the journalists;” the indigenous were limited to preventing us from approaching the presidency, the PRI and the market. Vehicles from the municipal police of San Cristóbal de Las Casas, the state police and investigative agents arrived sounding their sirens towards 11:30 in the morning and they cordoned off the front part of the plaza with anti-riot equipment and regulation weapons. The extreme nervousness of the agents and functionaries is the most alarming of all. They immediately proceed to collect cartridges and other evidence, and only later do they use latex gloves and bags. Rather than investigating, they are cleaning up the plaza. From early on, the social networks were flooded with a lot of photographs of the dead functionaries. One of every two Chamulans must have a cell phone. “A lot of photographers were there,” relates the witness quoted above. Nevertheless, the first press images are from the air and from when the patrols were already at the place. All the images that circulated in the networks and some media were from local residents and are late scenes. Towards noon, a pick-up truck goes into the plaza. Two women are in the box. One, an older woman, cries inconsolably. Two men get out of the cabin, pick up the body and hastily throw it into the vehicle’s box, face down. So that the doors can close, they bend the knees up, only his feet and the soles of his huaraches are seen once they close the back door of the box. The second woman gets in to the cabin and the pick-up departs. Various police surround the scene without daring to intervene. The woman looks briefly at the feet of the body, turns the face and cries desperately. Nearby, a white truck picks up another body. Soon, only police agents and patrol cars were in the proximity of the buildings of the PRI and of the municipal council. Not one business is open in the entire town. The people are sheltered in their homes. Some families remain on the flat roofs of the houses near the plaza. At the border between San Cristóbal and Chamula, in the middle of the road a little sign warned in the morning: “Don’t go to Chamula. There’s a problem.” To say the least! San Juan Chamula is close to the tourist mecca of San Cristóbal. Chamula is the home of “traditional” religious practices, or at least that’s what they tell the tourists. Day trips for tourists to Chamula are very popular and the municipio (municipality, or county) makes a lot of money from these tourists trips. Chamula is also home to some of the thugs who attacked, evicted and destroyed the encampment and occupation of the “people’s movement” in San Cristóbal. In its Open Letter to the Governor of Chiapas, the EZLN warned the Governor of the danger of stirring up the rivalries in Chamula. On the morning of July 20, the sit-in protest in rejection of education reform that the National Coordinator of Education Workers (CNTE) has maintained on the toll road to Tuxtla Gutierrez, was destroyed “by a group of 150 armed people.” The representative of Section Seven, Adalberto Rabanales, said the attackers belong to “two attack groups: ALMETRACH (Association of Tenants of Traditional Markets of Chiapas) which works with the Municipal President of San Cristobal de las Casas, Marco Cancino- and a group led by the mayor of San Juan Chamula, Domingo López González, a member of the Green Ecologist Party.” These groups “of attack and the Municipal Police arrived to cause damage, employed the use of firearms and tear gas, respectively.” That same day, according to Radio Regeneracion, four people were reported injured: Rumualdo Guadalupe, primary school teacher who had his body pierced from behind by a firearm projectile, Guadalupe Estrada, wounded by a bullet to the shoulder, one person by a blow with a firearm and another who was run over. The final toll has not been released. There were also attacks on the press. Dolores Rodriguez of Chiapas Network News, was assaulted and injured. Tuxtla Gutiérrez, Chiapas. Pozol, 18 July. Thousands of parishioners from 52 parishes of the dioceses of San Cristobal de las Casas pilgrimaged in solidarity with the teachers and to commemorate the 25 years since the establishment of the Pueblo Creyente movement, which began in 1991 “to seek justice and respect for the most basic rights of being human” stated the pilgrimage organisers after a long walk. Among the participants in this massive pilgrimage were members from the groups in the Highlands, Lowlands, Cho’l, Southeast, South, Tsotsil, Tzetzal and the Centre. They delivered food supplies to the teachers’ picket in Tuxtla, who have been there since 15 May, protesting the self-styled “education reform”. “We demand an alternative education project”, stated the protesters, among whom are teachers from the trade union sections 7 and 40, which belong to the “Coordinadora Nacional de Trabajadores de la Educación (CNTE – or National Coordinator of Education Workers). “The people’s patience has run out,” said the indigenous communities and campesino pilgrims categorically. “Enough! We’ve had it with so many lies and tricks; with the exploitation of the poor, and with the manipulation of laws and use of violece,” they stated. The spokesperson for the Pueblo Creyente Joel Padron asked that the CNTE teachers “don’t get up from the table of dialogue with the Government until we have achieved a Mexico that we want.” This pilgrimage will not finish until we have achieved justice,” added the priest who had been imprisoned in 1991 and for whom the indigenous communities went on pilgrimage to demand his freedom. Father Marcelo from the parish of Simojovel said that if the government continues to insist on imposing this education reform, we don’t discard the possibility of walking from Chiapas to Mexico City. “A pilgrimage is to liberate people through walking, yelling, and telling the truth,” said the pastor. “If the government imposes these reforms by force, it will do so only by making our blood run,” warned the priest from Chiapas. With the violent death of five people after a dispute between members of the Green and PRI political parties, affiliated with the government, in the county seat of San Juan Chamula, once again the state administration of Velasco Coello has demonstrated its disregard for the lives of members of the indigenous communities in Chiapas, whether or not they are their allies. Since the government assumed power, the administration has continually stimulated and incentivised conflicts for the political benefit of itself and its “green Ecology” party. In the municipality of Chenalhó they also have had deaths in consequence of the party political disputes between the Greens and PRIistas. Last May, a child died from injuries received as the result of a fight between sympathizers and groups opposed to the ex-mayor Rosa Pérez. And, as a result of the climate of fear present in the region, on June 23, 2015, a member of the civil society organization Las Abejas de Acteal was assassinated. The organization said that Manuel went to the municipal head of Pantelhó. Upon returning and accompanied by his 11 year old son Juan López Guzmán, in the height of the Sibaluk´um bridge about a kilometre from the municipal head of Pantelhó, seven people dressed in military clothing with firearms ambushed the public transport vehicle in which he was travelling, killing him with three shots. The events in San Juan Chamula also bring to mind the death of Zapatista teacher Galeano, on May 2nd, 2014, after a series of manipulations by the governments of Velasco and Peña Nieto to create tension between other indigenous communities and the Zapatistas. Another issue is the displaced indigenous families in the region, like the cases of the community Primero de Agosto in Las Margaritas, and Banavil in the municipality of Tenejapa, and the colonia Puebla, in Chenalhó; the government does not see or hear their demands for justice and return to their communities. The social extravagance, the lack of support and the zero fulfilment of campaign promises were the main reasons why the indigenous of San Juan Chamula staged a confrontation with gunshots, sticks and stones, which killed the mayor Domingo López González, his assistant Narciso Lunes and the justice of peace and reconciliation, Sebastian López. The true guilty party has not been nor will be arrested; it is Manuel Velasco Coello. Although the Attorney General of the State (PGJE), is working to arrest the perpetrators of the killings in Chamula, the one truly responsible continues to enjoy his life of luxury and excesses, the governor will not go to San Juan Chamula, and this has provoked the anger and resentment of the people. While nothing justifies depriving another human being of life, Manuel Velasco set off a time bomb, he was warned that trouble would break out unless measures were taken in the matter; this was not done, and the bomb exploded; the result as we all know, is several people dead and wounded. Currently the majority of the inhabitants of Chamula live in inhuman and precarious conditions. They live in one room made of wood and cardboard, sheets of plastic and rags, with an earth floor and a roof of old plastic and tin, which along with the low temperatures (1°C), makes them ill. This along with the lack of adequate food makes them more vulnerable to disease, they have no means of livelihood, much less education and health. When Velasco Coello was campaigning for governor, he said he would take up this matter, he would support them and they would have better living conditions; this did not happen. In a few months Velasco will leave the governorship, and the state remains the same or in worse conditions. This means it is up to us to decide who will lead the direction of our state to where we want it to go. Indigenous Peoples Caravan passing through Nochixtlán. With the ongoing teachers’ strike that has morphed into a widespread rebellion, primarily in Oaxaca and Chiapas, we haven’t put together a more general roundup of resistance and repression in Mexico in some time. While that struggle is very much alive and well, the intensity with which it is unfolding has diminished some. This column will first take a look at the past three weeks of that conflict (if you need to get up to speed, check out this piece) and then cover some of the other recent events around the country. The teachers belonging to the National Coordinator of Education Workers (CNTE) have now been on strike for more than two months. Since the massacre by federal and state forces in Nochixtlán, Oaxaca on June 19, in which eleven people were killed, the conflict has taken on an increasingly popular dimension. This has looked like direct actions, marches, material support and expressions of solidarity from across Mexico and beyond, in numbers far too large to recount individually. By way of example, here are some of the actions that have occurred over the past few weeks. Parents and teachers took over toll booths in both Mexico City and Durango for a day, allowing cars to pass through for free. On July 3, an explosives device was detonated at the headquarters of business associations in Mexico City who have been lobbying the government to crush the uprising. There were three days of intense mobilizations from July 5-7 in Mexico City. On the first day, there were at least 70 simultaneous blockades and marches, followed by four mass marches on July 6, and at least ten blockades on July 7. The Zapatistas have continued releasing statements in support of the teachers’ struggle, stating, “To say it more clearly: for us Zapatistas, the most important thing on this calendar and in the very limited geography from which we resist and struggle, is the struggle of the democratic teachers’ union.” They also went further and announced that they were suspending their participation in the July 17-23 CompArte Festival for Humanity, which they had called for earlier this year. Instead, they sent delegations from all the Zapatista caracoles to donate the food they would have eaten during the seven-day festival to the teachers in resistance in Chiapas. This amounted to 290,000 pesos (15,600 USD) worth of food. In recognition of the contribution of the people to their struggle and the fact that the people have demands which extend beyond the immediate concerns of the union, on July 9, Section 22 of the CNTE in Oaxaca called for a gathering of teachers and indigenous leaders to “build a peoples’ agenda against structural reforms.” The union met with authorities from 90 municipalities in the state. Important to note is that these authorities are selected as the moral leadership of their communities not through a vote based on political party, but through nominations, discussions and agreements reached in community assemblies. The first outcome of that gathering was the Indigenous Peoples Caravan, which traveled from Oaxaca to Mexico City from July 17-19, with the participation of more than 120 municipal authorities and the teachers’ union. The union is making a similar effort in Chiapas, where they announced union delegates will visit every community in the state to meet with parents and members of civil society. Also in Chiapas, 52 church parishes, primarily adherents to liberation theology, marched in support of the teachers on July 19. Along with Oaxaca, Chiapas and Mexico City, Michoacán has been holding it down. On July 11, teachers blockaded train tracks at seven different points throughout the state. (Michoacán is home to Lázaro Cardenas, Mexico’s biggest port and one of the largest seaports along the Pacific.) A week later, on July 19 and 20, state and federal forces attacked teachers’ highway blockades there, with 25 teachers being arrested on July 20. More by coincidence than coordination, an attack also occurred on the highway blockade outside of San Cristóbal de las Casas, Chiapas on July 20. In that incident, state and municipal police loaded armed and masked members of the Green Party (PVEM – a right-wing party distinct from international Green Parties) from San Juan Chamula into a tractor trailer, drove it to the blockade and opened it up, providing cover while the paramilitaries attacked and burned the blockade and encampment. Fortunately there were no deaths, though one teacher was shot in the shoulder by a paramilitary. In response, teachers and supporters regrouped in the city center of San Cristóbal, taking over the old city hall and flying a red and black flag from it. (Along with the anarchist connotations, a red and black flag flying from a building in Mexico typically signals that the workers in that building are on strike.) They then marched back to the site of the blockade and built it up once again, where it remains. More context on San Juan Chamula to come later in this piece. At the same time that all these actions have been occurring, the CNTE and the Interior Ministry have been holding negotiations. They have met a total of six times, addressing political, educational and social issues. At each meeting the teachers come prepared with specific proposals and ask the government to do the same. After each meeting the end result has been the same: no progress. They will meet again on July 26. The last bit of news from the electoral realm is that on July 14, Andrés Manuel López Obrador (AMLO) – who for Mexican politics is something like a never-ending Bernie Sanders – proclaimed, “You can’t repeal the educational reform; that would be a failure of government and doesn’t serve anybody. There must be authority.” AMLO’s latest party, MORENA (he used to be PRI, then PRD), has tried to capitalize on the teachers’ strike to grow their numbers yet its partisans have been notably silent regarding their leader’s rejection of the main demand of the strike. In some sad news, a teacher, José Caballero Julián, who was wounded on June 11 when state forces attacked the teachers’ encampment in front of the Oaxaca State Institute of Public Education (IEEPO), died of his injuries on July 5. In addition to the eleven massacred in Nochixtlán, Azarel Galán Mendoza who was killed in Viguera and Salvador Olmos García, the anarchist and journalist murdered by police in Huajuapan, Caballero’s death brings the total to fourteen killed by the state in Oaxaca during the course of the rebellion so far. While the growing national mobilizations initiated by the teachers’ strike has dominated headlines and coverage from Mexico, there are of course numerous ongoing resistances that at least on the surface can be seen as independent of that struggle. The matter pending before the union and the people in resistance is if and how these fights, most of which are directed against neoliberal capitalism and the state, can be coherently integrated into a broader movement. As mentioned above, steps have been taken in that direction, but for the most part it is still the teachers union at the wheel. “Occupy your destiny.” Recent street art in Oaxaca. Students from the Xochimilco, Azcapotzalco and Iztapalapa campuses of the Autonomous Metropolitan University (UAM) in Mexico City won a major victory earlier this month after occupying the university President’s Offices. The takeover was in response to cuts in scholarships for studying aboard or elsewhere in Mexico. After holding the building and following a twelve hour meeting with the administration, they left with the university agreeing to fund 100 percent of scholarships. Also in Mexico City, riot policeattacked a gathering of indigenous peoples at the Monument to the Revolution on July 15. The organizations and communities were protesting their exclusion and the exclusion of indigenous practices from the process Mexico City is currently going through to restructure its form of governance. The violence continues unabated in Veracruz, where on July 7, Jairo Guarneros of the Colectivo Feminista Cihuatlahtolli in Orizaba,survived an assassination attempt that occurred one day after he denounced the police murder of a woman riding in a taxi. After killing the woman, the police fled the scene. Pedro Tamayo Rosas became the 17th journalist murdered in Veracruz during the reign of Governor Javier Duarte. Shot eleven times at his home on July 20, Tamayo lived in and reported on the Tierra Blanca region. He had previously fled the state following threats he received for his coverage of the disappearance of five young people by police in that region in January. With his legacy of oppression, violence and exploitation, Mexican President Enrique Peña Nieto certainly has a lot to make amends for. So what did he actually decide to apologize for? On July 18, he asked forgiveness for the “perception” of wrongdoing that occurred when in 2014 his wife purchased a $7 million mansion – known as the White House – in Guerrero from a corporation that had tens of millions of dollars’ worth of government contracts. Two days later, the well-known journalist who broke the story, Carmen Aristegui, was sued by her former employer, MVS Radio, to stop the publication of a book on the Casa Blanca scandal. MVS fired Aristegui in 2015 after she first reported on the story. Naturally, MVS and the federal government deny any collusion. In Cuidad Ixtepec in Oaxaca, organizing continues against attempts by the Canadian mining company Linear Gold Corporation to mine in the area, a project that would not only damage the environment but also archeological sites. On July 12, indigenous women from Ixtepec destroyed a concrete topographical marker put in by the company, followed by a 500-person protest a week later. As was mentioned above, the Zapatistas stated they were suspending their participation in the CompArte (a spin on the words “art” and “sharing”) Festival for Humanity. In one statement, they offer a breakdown of the original plans for the 1,400-plus artists who were going to participate (along with a video of Zapatistas dancing to Ska-P). In response, CIDECI-Unitierra, who often assists in the organization of Zapatista events in San Cristóbal, announced they’d still be holding an abridged version of the festival. In response to that response, the Zapatistas backed off their decision to not participate at all and invited everyone to come to Oventik on July 29 to participate in a condensed presentation of what they had prepared for the festival. And then three days later it happened. On July 23, a group of individuals affiliated with the PRI showed up at the town hall demanding that the mayor – affiliated with the PVEM – pay them the money he owed them for their artisanal work. He refused to do so at that moment and the PRIistas stormed the building. The mayor and his bodyguards opened fire and an hours-long shootout commenced in the center of the town. In the end, five people were killed, including the mayor. San Juan Chamula is a popular tourist destination due to its religious festivities and proximity to San Cristóbal. It is also a deeply divided Tzotzil municipality. This began decades ago following the conversion of growing numbers of Chamulans to evangelical Christianity by outside missionaries. They clashed with those who remained adherents to the indigenous-Catholic tradition that emerged following colonization, using the pretext of religion to settle disputes over land and territory, leaving dozens dead. Political parties – primarily the PRI and PVEM – have supported or attacked these factions depending on the needs of power, leading to events like the ones seen on July 20 and 23. Another conflict between the PRI and PVEM caused the deaths of two people and the displacement of 81 in Chenalhó, Chiapas on May 26. Manipulation of internal divisions by political parties within a context of neoliberal exploitation is one of the main factors pushing many indigenous communities to organize for autonomy, to ban political parties and to return to making decisions using community assemblies according to practices generically referred to as usos y costumbres. 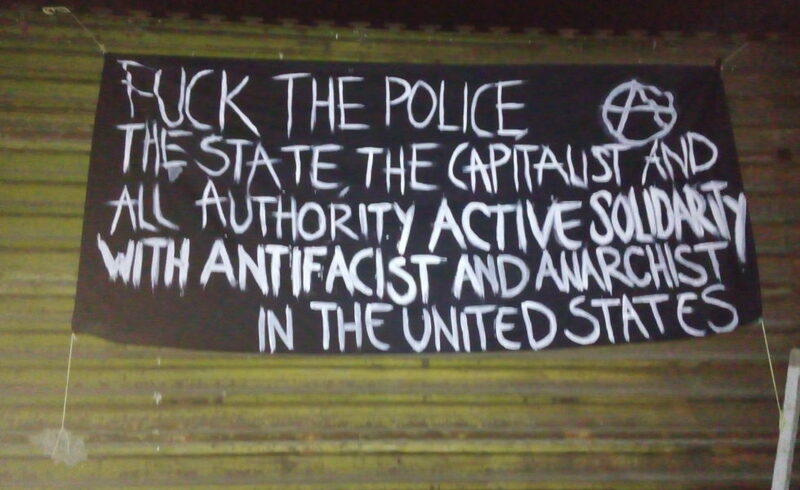 In our last bit of news, some anarchists in Tijuana published a roundup of some of their activities in recent months, including sabotage attacks and banner drops – some in solidarity with anti-police and anti-fascist mobilizing in the US and anarchist political prisoners worldwide. Jmololabex ants winiketik, icha spatil a whotanik ta pisilik ta yuun jmololab kotik ta organización ta ejido san Sebastian Bachajón. Compañeros and compañeras in struggle and resistance, receive a combative greeting from the compañeros and compañeras adherents to the Sixth Declaration from the ejido San Sebastián Bachajón. On this day we express on behalf of our organization and struggle our support and solidarity with the defenders of public education against the so-called education reform which the Mexican state wants to impose. We want to tell teachers that we support and we join their fight to defend education as a right for all our countrymen, so that future generations have this free space to have access to public education, we are following their struggle, because it is also ours. Teachers, from our hearts we tell you not to give up, for one minute on your feet standing in struggle is worth more than a lifetime on your knees. We are here because our voice is stronger than any wall, the weak do not struggle. Those who are stronger perhaps struggle for an hour. Those who are even stronger, struggle for a few years. But the strongest of all, those who struggle for their whole lives, they are the indispensable ones. A month since the brutal repression in Nochixtlan, Oaxaca, on 19th June, when the federal police opened fire on the demonstrators, and several of them were killed by gunshot fire, we hold the bad government responsible for any repression and aggression against Mexican society; the bad government can beat us, can kill us, can take our bodies, but it will never make us obedient to a traitor to the motherland. Finally, from the bottom of our hearts, with our brothers and compañeros in struggle we have put together a little help and we deliver these supplies to the defenders of public education, in order to support the mobilization in which they are active today. Long live the dignified struggle of the defenders of public education! No to the dispossession of indigenous territory! State police out of indigenous territory! Immediate return of the disappeared and murdered compañeros from the Normal School Raúl Isidro Burgos of Ayotzinapa! Long live the dignified struggle of the Chol compañeros and compañeras from the ejido Tila! Long live the dignified struggle of the compañeros and compañeras from San Francisco Xochicuautla! Long live the peoples who struggle for their autonomy and freedom! JUSTICE FOR AYOTZINAPA, ACTEAL, ABC, ATENCO, NOCHIXTLÁN, OAXACA! JUSTICE FOR OUR COMPAÑERO JUAN VAZQUEZ GUZMAN!